The Government-size Costa Recon features slide cuts fore and aft, a single-side safety and Chris Costa's name and logo on the right side of the beveled slide. If you have looked at more than one online video of someone running an AR or a 1911, chances are you saw Chris Costa in it. I have not yet had a chance to attend one of his classes, but from looking at the Costa Recon model 1911 from Nighthawk Custom, I can say this: He and I agree on a whole lot of the details that should be on a 1911. For starters, this is an all-steel, Government-size 1911 with an accessory rail. The front sight is a fiber optic with a red insert. I'm up and down on fiber-optic sights, but on the plus side, if the fiber breaks and falls out, you still have a front sight. Plus the front sight blade is thinner than usual, something we all experimented with back in the day, and a lot of us found it good. I still do. The rear sight is Jardine Tactical Hook, which is shaped so you can, in a pinch, use the rear sight as a ledge to work the slide. You can use a stiff holster edge, doorframe, whatever. The two in combo give you lots of light around the front blade, but the rear notch is not so large you feel "lost" looking for the front sight. The slide is not curved on top but instead has three flats. The top one, horizontal to the frame, has sight grooves in it to lead your eye to the front sight. The rear of the slide is hand-serrated to cut glare. On the side, ahead of the ejection port on the right, Nighthawk has engraved the "Costa" name and Chris' logo. The company reserved the left side for its own logo and name. The bottom edge of the slide has been beveled, so there is not a sharp edge there to wear on your hands, belt, clothing or holster. That bevel is an interesting evolution. When custom guns were new, almost no one paid attention to a slide bevel. Now, if a custom gunsmith fails to do it, some might consider him a hack. There's no hackery at Nighthawk, that's for sure. Below that bevel, the slide stop pin has been shortened, flush with the frame, and the hole in the frame slightly beveled so you are unlikely to press it out inadvertently. The slide has cocking serrations fore and aft, and if you like that, great. Me, I think I'd do some pleading and have the front ones left off if I could. The rear of the slide is serrated, and those serrations would stay. Inside the slide there is a Nighthawk match barrel, fitted as you would expect: like a bank vault, with a lowered ejection port to allow empties to depart with ease. The muzzle is finished flush with the bushing and crowned—a look that's both traditional and quite attractive. The thumb safety is on the left side only, although you can get an ambidextrous safety as an option. My peculiar hold causes almost all ambi safeties to bind on the knuckle of my right hand trigger finger, and thus I often find them less than useful. 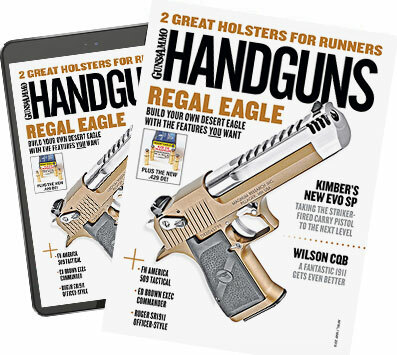 The grip safety is high cut, as is the frame at the trigger guard, so you can get your hand as high on the Costa as you can on any other 1911 out there—and higher than on some. Some discount the high-cut shape, but once you get used to it, you will not want any other shape on your 1911 frame. The grip safety has a "speed bump" on the bottom, to ensure your hand depresses the safety. Also, the grip safety is "sensitized"; it works as a grip safety should, but you need only press it in a third of its travel or so to clear the trigger bar—making it a lot more forgiving of a hurried grip or a stress-altered firing hold. The trigger is a medium-length solid aluminum design, and the resulting pull is clean, crisp and easy to manage but not so light it would get you in trouble. Meant as a carry/duty gun, the Costa comes with a 3.5-pound trigger pull. The frontstrap and the mainspring housing are checkered 20 lpi and are aggressive enough without being razor-sharp. Back when I was a working gunsmith, I loved really sharp checkering, but now that my hands are not nearly as calloused, I find a less edgy finish still keeps the gun from slipping and pleasantly keeps my hands from bleeding. The magazine well has a huge funnel that is an integral part of the mainspring housing. Machined as a single piece, the mainspring housing/mag well is blended to the frame, which is beveled in the opening itself. If you miss this on a reload, it won't be the gun's fault. Once all the metal work is done, the Costa Recon receives a Melonite surface treatment. And to keep your hands fully in control of the Costa on the draw and while shooting, Nighthawk installs a set of 10-8 Performance grips in a color it's calling Hyena Brown. I'm not sold on the grips. As I said, I'm not the working-man-hands tough guy I used to be, and the grips are too aggressive for me. And I'm not so hot about how edgy they are—and the possibility of them not staying out of the way of a jacket or coat lining. Time will tell there, and since they're G10, I could always sand them down a bit. The grip's thumb groove to allow faster reloads is superfluous for me. I think this is one of those size differences. My hands wrap around a 1911 frame just fine. Unless the grips are truly portly, I have no problem reaching the mag button. The groove is not "normal" to my hand, so I notice it. Oh, and the magazine button is taller than normal, but not so tall it was a problem. Again, hand size matters. I've shot (or attempted to shoot) competition 1911s with magazine buttons so tall that every time I shot them, the mag button got depressed in recoil, and the magazine fell out. That isn't a problem here. And if you have small hands, you'll probably find it advantageous. For me it was just another mag button. The Nighthawk Costa Recon uses a full-length guide rod and the Nighthawk/Marvel Everlast spring system. The Everlast system increases recoil spring life, and Nighthawk assures us that you can go 10,000 rounds between changes. I've never had a problem spending the money to replace a recoil spring when needed. I'm also not too concerned with how many rounds each spring gets. Springs for me are timing devices, and I'll experiment with lighter or heavier ones until I find the one that, in that pistol, times the sights to come right back on target. When the recoil timing starts to wander off (as a speed drill will uncover) I then swap out a spring with a replacement that does time it correctly. That's why you'll read about the top shooters, USPSA/IPSC Grand Masters, running a non-standard spring weight. They use it to time their guns. Will changing to their spring weight speed you up? Only after you've put in the 100,000 rounds they have and have hands and arms identical to them. So while for me the guide rod/Everlast system isn't a plus, for most shooters it is a real bonus. A 10,000-round spring life? For most shooters, that's several years of shooting. Even for an aspiring competition shooter, that's more than the first year's practice is likely to be. And being a standard 1911, you can swap out the recoil spring system if you find you don't like it. I predict most new Costa Recon owners will find it works just fine for them and will leave it alone. In test firing and in drills, the Costa did not fail to function, despite my throwing a wide net for .45 ACP ammo. I even added some of my own reloads, my match ammo from the good old days. A lead 200-grain semi-wadcutter at just over 900 fps, it had a good speed cushion back when Major was stout, and is now just hot, accurate ammo. With this, if a pistol won't shoot accurately, you can pretty much be sure it won't shoot accurately. The Costa shoots it accurately, and in a quick zero check, I went 10 for 10 on the 100-yard gong. Sitting down at the shooting bench, I loaded up with Wolf 230-grain full metal jacket in steel cases. The first shot punched out the small aiming dot I had on the target. The second and third shots were nowhere to be seen. "Oh frak!" I thought. I've either broken Nighthawk's gun or the shots went two feet wide at 25 yards. So I holstered and started walking to the target. Halfway there, I realized that the three shots were in such a tight group I hadn't noticed it at the bench. I sat down again, figuring such a tight group would be hard to continue, so of course I slapped the trigger on the next two shots, and opened it to a two-inch group. The bad part was, the Costa was not at all a fan of Wolf. (Clearly, I hadn't thrown the net wide enough in drills.) All the testing I had done to that point had been with brass-cased ammo. The Wolf, while shooting brilliantly, was just not what the Costa liked to feed. I swapped back to brass ammo, and it worked fine. I then dug out a box of Hornady steel-cased ammo, and it fed that just fine. I did a quick check with another 1911, and it fed the Wolf fine. So this particular Costa, for some reason, is not a fan of Wolf. Even though it didn't like feeding Wolf, the Costa liked shooting it—and everything else I had to test it with. The narrow front blade makes it wicked fast on drills and target arrays. The red-dot sight glows like a nuclear fireball on a sunny day. One of the really accurate loads in this Costa Recon was the Hornady Z-Max ammunition. I don't know what Chris' stance is on zombies, but even if he doesn't believe in them, this guns shoots that ammo superbly. The final detail is the price. At a decaf mocha under $3,500, it may seem a bit pricey. When I began this great experiment called practical shooting, there was no such thing as a ready-to-go custom gun. Adjusting for inflation, a $3,500 1911 today costs the same as a $1,200 1911 in 1979. And, yes, my first 1911 ended up costing me more than $1,200 before it was done. The Costa Recon is ready to go, right out of the box.